During the Save Our Sharks Expedition 2016, four tiger sharks were tagged in Sint Maarten and on the Saba Bank with satellite tags, allowing us to track them and gather information about their migration patterns. The tags are attached to the dorsal fin of the tiger shark. Each time the dorsal fin breaks the surface, its location is sent to the satellite. April 2017: Quinty has not been showing herself at the surface for weeks. This means she has been spending her time at depth, otherwise the satellite would have picked up a signal. We wonder where she will come back up next. March 2017: After spending three months near Trinidad and Tobago, Quinty is now Northbound, swimming towards the small Caribbean island Barbados. February 2017: In February, Quinty spent very little time at the surface. She only pinged once East of Trinidad. January 2017: Quinty seems to have no intent to go elsewhere and spends all her time around Tobago island. December 2016: Over the past month, Quinty traveled towards the Southeast of the Caribbean Sea in the direction of the Atlantic Ocean. She is now spending most of her time at open sea, close to Trinidad and Tobago and she gives off a signal almost daily. November 2016: Quinty left the Saba Bank and swam a large distance towards the South. She is currently swimming in Dominican open water. October 2016: Quinty was tagged with a satellite tag on October 19th, 2016 in the East of the Saba Bank. She looks healthy and with 3,4 meters in length, she is a relatively large female tiger shark. The first few days she spent close to the tagging site and did not make any large journeys. Little is known about the current state of shark populations in the Dutch Caribbean. Even less is known about their behavior and which areas they use as nursery and feeding grounds. This kind of information is essential to ensure the long-term protection of sharks and rays in our waters. That’s why Save Our Sharks, a shark conservation program headed by the Dutch Caribbean Nature Alliance, a regional alliance of protected areas on the islands of Aruba, Bonaire, Curaçao, Saba, St. Eustatius and St. Maarten, organized this expedition. The project is funded by the Dutch Postcode Lottery. 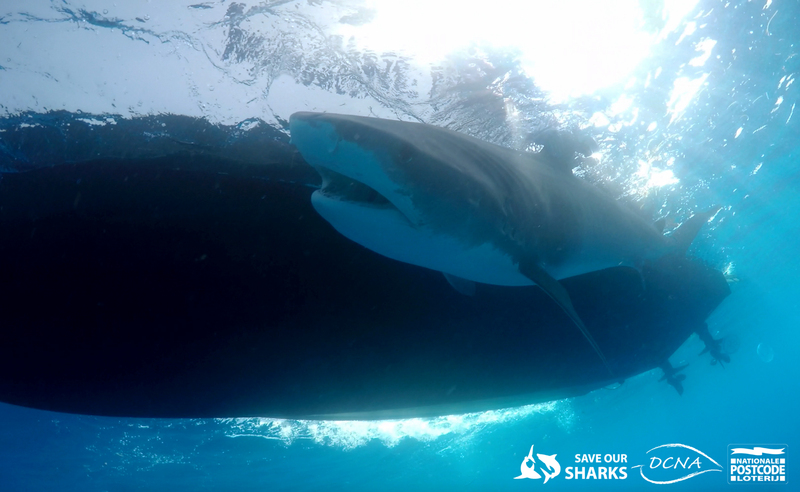 The main aim of the expedition was the tagging of highly migratory species, such as tiger sharks, with satellite tags that will allow the sharks to be tracked for up to two years. The scientists hope to discover the migration patterns of these large sharks in the wider Caribbean and beyond. Additionally, 10 sharks will be fitted with acoustic tags, which will be used to gather information on their local movement patterns on the Saba bank. Shark scientists and conservationists from the Saba Conservation Foundation (SCF), Nature Foundation St. Maarten (NFSXM), Florida International University (FIU), and Sharks4Kids were onboard the “Caribbean Explorer II” that set sail from St. Maarten. The aim of the expedition was to learn as much as possible about shark abundance and diversity on the Saba Bank. Sixteen of these sharks were Caribbean reef sharks (Carcharhinus perezi), which were fitted with PIT tags under the sharks’ skin just below the dorsal fin. PIT stands for Passive Integrated Transponder, which essentially acts as a lifetime barcode allowing scientists to identify sharks and track their movements. Veterinarians also use this type of tag to ‘microchip’ pets such as cats and dogs. The other six sharks were tiger sharks (Galeocerdo cuvier), four of which received their own custom fitted satellite tracking device. Tiger sharks spend quite a lot of time at the surface, which allows satellite-tracking devices to be used to track their movements with pinpoint accuracy. The satellite tags were Wildlife Computers SPOT (Smart Position or Temperature Transmitting) tags, which were attached to the first dorsal fin of the sharks. These tags transmit a signal to satellites, which allow the animals to be tracked through the ARGOS system for up to four years. The tags use radio transmissions, so they must be exposed to air in order to transmit. Each time the dorsal fin breaks the surface, a geolocation estimation is given with an accuracy of a few hundred meters.